Charlie Duckworth returns with another interesting build summery. In 1921, American Car & Foundry (AC&F) built 500 single sheathed boxcars for the New Orleans, Texas & Mexico Railroad. These cars had peaked roofs and wood ends with steel bracing. The Missouri Pacific added these cars to their boxcar fleet when they acquired the Gulf Coast Lines railroads in January 1925. The cars were repainted into the parent company’s standard with the revised ‘Mopac buzz saw’ (the revision being the addition of ‘Lines’ to the logo) now appearing on the sides of the newly acquired GCL and I-GN equipment for the first time. Although the cars only had 8-foot high interiors, they lasted quite a long time with 451 still on the roster in 1948. 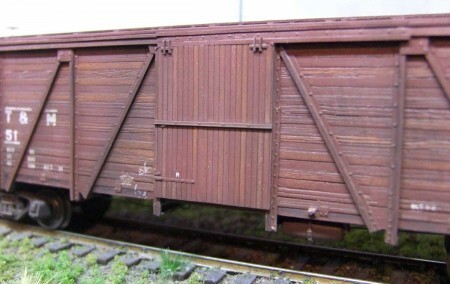 Due to a shortage of cabooses on the Mopac during WW2, 90 of these boxcars were converted to war emergency cabooses with personnel doors and windows added to the carbody. After the war, many of these cabooses were transferred to maintenance of way service. This HO scale model started out as a Dennis Storzek Soo Line boxcar kit, offered in 1989. It’s made up of seven major resin parts; roof, sides, ends, and underframe. White metal castings are included for several of the smaller parts. The castings are beautifully done. The wood sides look like the prototype, meaning, no large seams run horizontally as when a pattern maker uses Evergreen car siding for the wood sides. The Soo Line decals perfectly matched the prototype and the instructions are well written. Since I wasn’t going to use the Soo Line decals, I offered them up on the Steam Era Freight Car YahooGroup and they were quickly snapped up. The NOT&M decals are from a recently released Mask Island NOT&M caboose set and it’s good for the boxcar as well. I started this model in 1989 and finally finished 26 years later! Not sure why, but it was just one of those projects that got stalled. I got the carbody built but changing the doorway from a 5-foot to a 6-foot opening seemed to be a hangup. After I retired, I dug it out again and had in done in just a few evenings. If you are going to modify the Soo Line kit to an NOT&M version I recommend you find a copy of Martin Lofton’ article “MoPac/Gulf Coast Lines 40-ton boxcars” in the March 1989 issue of Railroad Model Craftsman. The NOT&M was the easier of the two as one only had to rebuild the underframe and redo the kit’s door opening. Sometimes waiting has it rewards as Westerfield came out with a door that matched the NOT&M door (CMO Fowler boxcar) and Archer brought out their decal rivets. I painted the car using Tru-Color MKT brown, as recommended by Ed Hawkins. To weather the individual boards, I used light brown and Sienna Brown colored pencils on the NOT&M boxcar ‘wood’ parts. 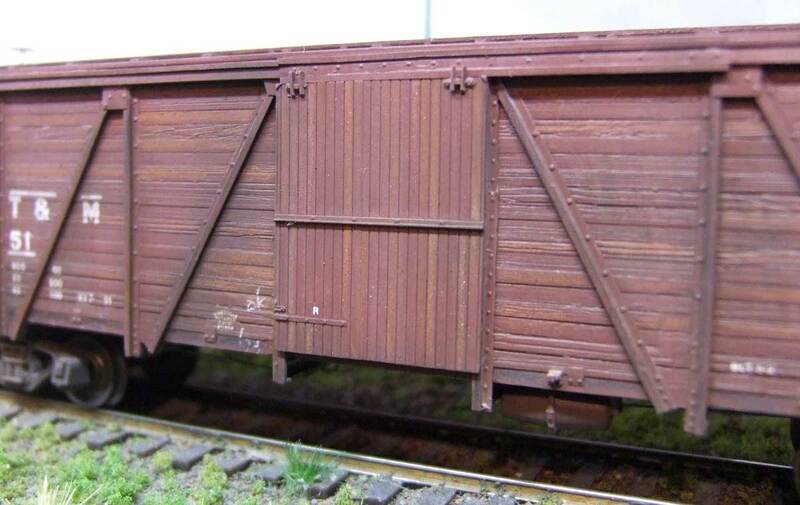 I wanted the car to look more weathered than others on the layout so I picked out some of the horizontal boards on the sides and ends and the smaller vertical boards that made up the door. You may not be able to tell but I also used a black colored pencil on the tops of the ‘Z’ bracing on the sides and the ‘metal’ part on the bottom of the car sides as well. NOT&M decals, dimensional data and Mopac buzz saw came from the decal scrap pile. I am a NYC modeler, and I have built one NYC hopper per your article. I plan to do more in the near future. However, I would like for you to do a NYC hopper with the correct dimensions, and ends. I would purchase atleast 10 kits. I think it was in the late 1990’s the RPI Hobby Shop had a clearance sale of what as it turned was the last run of the Storzak kits under the Des Plaines label and I purchased five kits, three of various forms of the DS kits (one ultimately built as a DSS&A model) and two of the SOO Line kits intended to be built as per Martin’s article. I have not done anything yet because I keep hoping someone will do the two variations plus the casting have a fair number of surface defects caused by air bubbles. At some point I will use a small drill and plug them with styrene rod. Glad to know about the Westerfield doors. I have been experimenting with colored pencils too so I am glad to see what Charley is using. I wish the MPHS would issue a set of comprehensive boxcar decals. Thanks for writing this up Charley! If you go to Hubert Mask web site or just google Mask Island decals, click on cabooses. 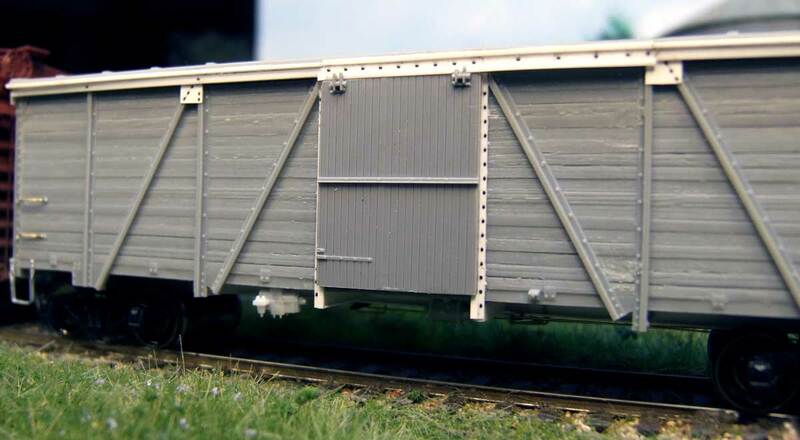 The NOT&M decal set showing a boxcar with a side door is the set that can be used for the boxcar. The Mopac didn’t bother to repaint the boxcars when 90 were converted to cabooses so the set is perfect for modeling the boxcar.